You've seen the inflammatory NSA slides, and now you can attach a name to the paperwork: His name is Edward Snowden, he has a ten-year history in government defense and intelligence gathering, and now, he tells The Guardian, he's leaked classified documents because he thinks current NSA surveillance techniques pose "an existential threat to democracy." Nonetheless, Snowden's words on video seem to reaffirm the Post's and Guardian's initial reports that the NSA has deep hooks into Big Tech, including real-time access to the data of American citizens—an assertion that's now being vigorously disputed by Director of Intelligence James R. Clapper. CNET has also quoted an anonymous former government official who says "None of it is true," referring to original reporting by The Guardian and Washinginton Post. "And do to that, they, the NSA specifically targets the communications of everyone. It ingests them by default. It collects them in its system and it filters them, and analyzes them, and it measures and it stores them for periods of time, simply because that's the easiest, most efficient, and most invaluable way to achieve these ends. 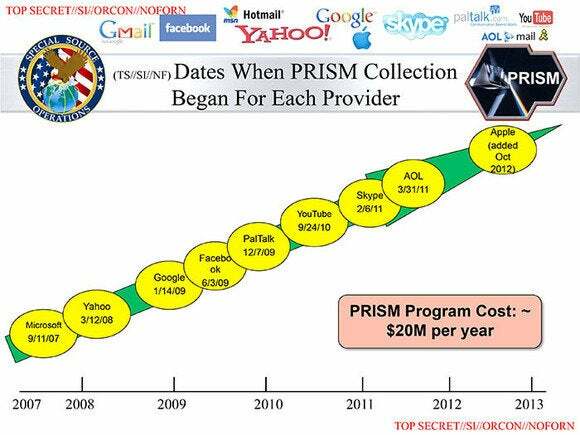 So far, the Guardian has leaked five NSA slides, ostensibly supplied by Snowden. This one indicates when various tech companies joined the NSA PRISM program. Snowden lived in Hawaii before he jumped into the whistleblower abyss. But three weeks ago he copied the documents that were later disclosed, and on May 20 left behind a girlfriend and a salary of roughly $200,000, and flew to Hong Kong, where he remains. As of press time, there was no official word from the Obama administration on Snowden's revelation. But speaking on ABC News Sunday morning—just hours before Snowden came clean—House Intelligence Committee Chairman Mike Rogers (R-Michigan) telegraphed at least one government position: "Taking a very sensitive classified program that targets foreign persons on foreign lands, and putting just enough out there to be dangerous, is dangerous to us. It's dangerous to our national security, and it violates the oath of which that person took. I absolutely think they should be prosecuted," Rogers said.